Welcome everyone – thank you for attending tonight’s reception hosted by The Horinko Group on behalf of the Water Resources Action Project, or WRAP as we have come to refer to the initiative. 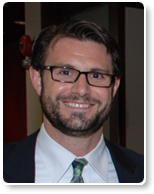 My name is Brendan McGinnis, in addition to heading The Horinko Group’s water-related efforts; I’m a proud founding member of WRAP. Before I get started, I should note that I don’t claim to be an expert on many of the items discussed here shortly, but I’ll do my best to describe the insights that I’ve gained over the past couple of years working alongside this group. I’d like to keep this dialogue informal, so rather than open it up to questions following the presentation, I’d simply encourage anyone that has questions, comments, especially feedback and ideas, to go up to one of the members here tonight, chat with them, find out why they became involved with WRAP, and what this initiative means to them. Let’s start off with a snapshot of what the water conflict looks like in the Middle East. More specifically, I’m going to focus on the bordering regions of Israel, Palestine, and Jordan – the initial focus of WRAP’s efforts. This region is one of growing population that is already dealing with dire water shortage problems. All three of these bordering countries rely on a shrinking and polluted Jordan River, and adding to this problem, the number of rainy days decreases each year. So, as you can imagine, freshwater is a precious resource for this region and its people. Some are looking to desalination, commonly referred to as desal, to provide the additional water that these people will need, pulling salt from the waters of the Mediterranean and Dead Sea, so it can be used for drinking, agriculture, flushing toilets, washing, showering – all things we often take for granted. Desal will certainly play a role, but it’s an expensive, energy intensive process that has a host of near-term challenges and limitations. Drinking water is scarce, whatever remains, if anything, is used for toilet flushing and hand washing. Whether an office building, home, or school – each is permitted only so much water each day for drinking and other uses. If they run out, they run out – the tap doesn’t continue to flow. These people are left with two options, wait until the next delivery of water or simply use less. Best case scenario – a tanker trunk actually shows up in a reasonable timeframe. And, even if it does, you are left purchasing drinking water at an exorbitant rate. During my last visit to the region in May of last year, this was certainly the case at a number of schools we visited. We have seen that school populations are impacted the most. Why? Because you have a large population of young students, centralized on a small site. And, even though some will have an appreciation of how scarce this resource really is, conservation will always be an issue when dealing with children. As you can imagine, it can be difficult to focus on learning when you’re thirsty, when the restrooms are temporarily closed, when they are dirty because there is only enough water to clean them twice a year. Yes, twice a year, at the beginning and end of the school year. Factor in that you will likely not have enough water to wash your hands, and you have a serious hygiene problem. To further complicate matters, many of these young girls are entering puberty. You now have a situation where students don’t feel comfortable attending school. So, we see attendance numbers drop, especially amongst girls. We have schools that would like to be able to provide summer school, but are not able to, because of the even greater water shortages over the hot summer months. This all leads to a greater dependency on municipal water that in this area is quite limited, often unreliable, and can constitute a very significant portion of a school, or household’s, overall budget. And, these tanker trucks, taking advantage of the situation of the regional water shortage, charge even higher prices, really putting these communities in a tight spot. Where do we go from here? A question without a definitive answer that initially brought our group together in early 2009, a handful of concerned environmental and legal professionals from diverse political, ethnic, and religious backgrounds, all wanting to make a difference in this region of the world, not later – now. That same year, we form a 501(c)(3), volunteer,non-profit called the Water Resources Action Project. I stress the word, volunteer. No one is paid, no one. Not knowing early on exactly where and how our group would be able to make the greatest difference, we kept our mission and vision flexible enough to let us figure it out along the way. Our mission – to improve the quality of life for underserved communities in the Middle East through greater water stewardship. I will add – while operating with strict political and religious neutrality. The most precious resource of this arid region will forever be water – not oil, but water. And, during an ever-shrinking timeframe of the year, typically November through April, freshwater falls from the sky, much of it soaks into the dry land, where it eventually finds its way into the Mediterranean and Dead Sea. A low technology, relatively low cost means to capture, store, and use this rainwater through collection systems could make a major impact. Two primary types are used – a rain barrel system and a cistern system. I don’t claim to be an expert on rain collection systems, but I’ve become generally familiar on how to build, operate, and maintain them. With respect to the rain barrel system, it’s pretty straight-forward – there is a collection unit that is placed on the roof of a house or building, the unit collects the rainwater as it falls, the rainwater runs through a gutter system, by way of gravity, to the ground level, where it is then stored in a number of large, plastic barrels. This water does not meet drinking water standards, but it can be used for a range of other needs, typically toilet flushing and hand washing. A small pump transfers the water from the storage barrels through a set of plastic tubing to selected toilets and faucets. A cistern system is a bit more complicated and costly, due to the excavation and concrete required. This system is placed in the ground and a concrete storage tank is poured that can hold a great deal more water than a rain barrel system. A similar type of pump is then used to pump the water from the cistern to its intended use. A cistern is typically used in the West Bank. Due to the very infrequent rainfall in this particular area, you want to capture and store as much as possible, which the cistern permits. Because of the remoteness of the villages in this region and political instability, water infrastructure is either grossly outdated or simply not found. The additional open space in these rural areas also makes it easier to construct a collection system of this size. On the eastern side of Jerusalem that borders Palestine, rain barrel systems are in high demand. The urban setting often doesn’t allow the construction of a cistern, and getting a permit to put one in is no easy feat. Taking these scattered pieces of information collected from our visits, discussions, research, and relationships, the path forward became clearer. Emphasizing a “results-only” approach, we would begin actively sponsoring and constructing rainwater collection systems within underprivileged schools of neglected areas that lack reliable, safe water. In order to do so, we would need local, trusted partners, working on the ground with a proven track record of “getting things done.” And, thankfully, we found the right fit. In January 2011, WRAP entered into a memorandum of understanding with Friends of the Earth Middle East (FoEME). FoEME is quite a unique organization – it brings together Jordanian, Palestinian, and Israeli environmentalists to protect their shared environmental heritage. With offices in Amman, Bethlehem, and Tel-Aviv, FoEME really does have a local presence in all areas of interest to WRAP. FoEME continues to be an invaluable resource for WRAP, assisting to identify candidate schools, licensed engineers for constructing the systems on time and within budget, and introducing us to an in-school partner for our initial two projects in East Jerusalem, the Only Green Environmental Center – a non-profit, operating within this particular community that coordinates our environmental education program and monthly reporting – the most important and sustainable element of our efforts that I will touch on shortly. The Sur Baher Girls School in East Jerusalem was selected as WRAP’s pilot school based on a number of criteria, the most critical being – it’s located in an underprivileged area, in an outlying region of Israel bordering Palestine; serves 800 Arab girls (grades 1-12); the school’s municipal source of water is costly and unreliable; the principal, teachers, maintenance workers were all enthusiastic to have this rain barrel collection system installed, and each were committed to working with the children to understand the purpose of the system, the value of water, and the impact that each student’s individual actions have on the surrounding environment and their neighbors. Myself, and fellow members, Bob Cole and Julie Weisman, were fortunate to attend the dedication of the system on May 19, 2011 with the school’s leadership and students. Also participating was Naomi Sur, Deputy Mayor of Jerusalem and our grassroots partners. Monthly reporting following the 2011 rainy season showed that our rain collection system was able to provide 30% of the total water used by the school during this timeframe. And by doing so, reduced the school’s dependence on the municipal system, the amount of limited resources allocated to its water bills, and improved the children’s understanding of water’s importance and conserving it – knowledge the we found was carried home with the students and transferred to parents, siblings, and neighbors. You may be wondering why the system only provided 30% of the school’s water, when I mentioned previously that such collection systems could provide up to 70% – why such a difference? First, the collection system wasn’t fully operational until February, so a significant portion of the rainy system had passed. Second, the rain collection system wasn’t adequate to meet this school’s needs. Recall, there are two restrooms, and the system that we installed only services one of them. What we learned – to expand this system to the appropriate scale, we would have only needed to increase our budget by a fraction of the initial dollars invested during the planning and design stages. In our defense, we had limited funds at the time, the school was eager to begin collecting water before the rainy season was too far gone, and we were eager to get started. However, this lesson will benefit us, and the children of this area, in all of our future projects. With our first year’s member contributions exhausted, we turned our attention to soliciting grants. Anyone working in a small, volunteer organization can attest to the fact that resource development is an ongoing and time-consuming challenge. Fortunately, WRAP was able to secure a small grant from The Jerusalem Fund for approximately $4,000 to complete the extension of the pilot project in February of this year. These additional funds allowed us to add a collection unit on the roof of the school, three storage barrels, and a pump. The harvesting system now services both restrooms. Before describing our second project, it’s worth noting (actually, it’s a key differentiating factor) that we don’t simply move onto the next school. We are committed to staying connected to each school that we establish a relationship with. We stay fully committed to each school, its leadership, and its children. We visit these schools during our semi-annual trips to the region, and remain closely connected through the school’s leadership, our partners administering the educational program, and our contractors maintaining the system. Our second project was also completed in February of this year – a rain barrel collection system at the Afaq School for the Learning Disabled, also located in East Jerusalem. The system services 765 boys with special needs. The project, that includes three years of maintenance and education, was funded by WRAP’s annual membership dues, as well as a $4,000 commitment leveraged by our partner, Only Green, and continued in-kind support from FoEME. Since the project was completed just last month, we are awaiting monthly reporting data, but anticipate similar water savings as our pilot effort. Following-up from our last trip in May 2011, we identified, visited, and prioritized a list of schools in need of collection systems. At the top of the list is the Walajeh Coed Basic School located in the small, rural town of Walajeh, outside of Bethlehem in Palestine. Vetted through our partner FoEME’s Palestinian office, this school has 319 students (165 girls and 154 boys) – the majority of whom are decedents of Palestinian refugees. United Nations Relief and Works Agency works within the school, providing assistance, protection, and advocacy. Water delivery is unreliable and costly. When the school runs out of water, the costly tanker truck is it’s only option, if it happens to show up that day. The bathrooms are cleaned twice during the school year. The principal that we met with is a very dedicated individual that is fostering a positive environment for his students, going above and beyond to ensure the continued advancement of each child. This project consists of a cistern collection system ($25,000 budget) that I will breakdown, line-by-line, on the following slide. Immediate benefits would include continued usage of cleanrestrooms throughout the entire school year, with water available for hand washing. The principal wishes to have a summer camp and even a community garden, both of which would become a reality with the installation of this cistern. WRAP is committed to funding this project. But, based on anticipated income from our membership contributions and the likelihood of securing grants in the near-term, this project will probably not become a reality until following the 2013 rainy season. Once this project is funded and completed, a number of additional schools with similar needs have been identified and waiting funding. Considering WRAP’s next trip to the region is in the coming weeks, I can ensure you that this list will continue to grow. This is a chart that breaks down the cost of each and every item that comprises the two types of systems that WRAP sponsors and installs. 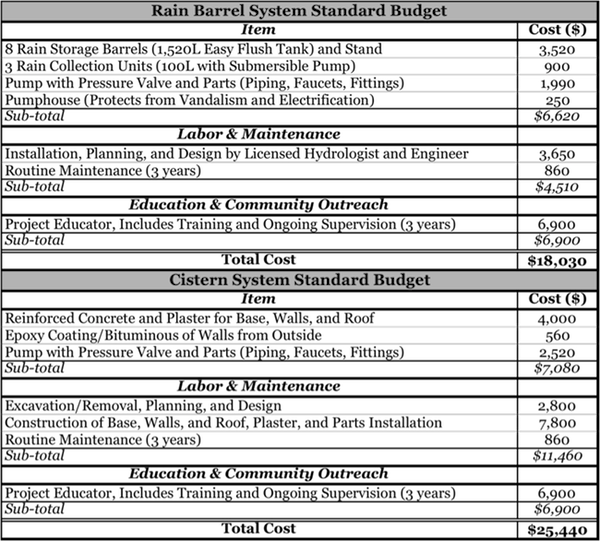 The average project cost for a rain barrel harvesting system is around $18,000 and the cistern system is $25,000. As I mentioned, the increased cost for the cistern system is due to the required excavation and concrete necessary to construct a subsurface collection tank. I should note that these cost figures include continuing education and maintenance for three years. All materials and labor are from regional vendors, aiding the local economy and fostering new small business incubation. For a young organization without a significant history working in this region, I’d say we are the poster child for adaptive management – taking an iterative approach to decision-making in the face of considerable uncertainty. Strong, parallel educational component is a must. The installation of a rain harvesting system will result in its own direct benefits to the school and its students, but a full understanding of the interconnected, and often unperceived, impacts of collecting and conserving water to the surrounding community and environment cannot be overlooked. Continued follow-up on projects, data collection, and reporting can never be underestimated – each validates the importance and impact of the project, not only to the school and its surrounding community, but also to our membership, donors, and ability to raise funds. It’s important to identify the end game and create a roadmap to get there – absent this, it’s very easy to lose focus and succumb to distractions. Why WRAP – Why Not? Most non-profits have paid staff with benefits, expenses, and travel costs covered. WRAP directs all contributions towards its projects – every penny of every dollar. If You’re Wondering – How Can I Help? Let me first say, our primary reason for inviting you to attend this reception was very simply to make you aware of how little it takes to make a very big difference. This effort has been one of the most rewarding, worthwhile, and satisfying experiences that I’ve had working with a non-profit organization. We simply wanted to share this experience with our friends and colleagues. If you think you’d like to become directly involved, we would be thrilled to have you join us for what we believe you’ll find a very rewarding way to reach out and help people that are suffering. If you’d like to contribute financially, please connect with me or any of the WRAP members. Or, you can donate anytime on WRAP’s website at www.wrapdc.org. No amount is too small – I cannot stress this enough. You can spread the good word. Become more aware of these issues discussed tonight, educate others, seek out your own solutions, and of course, let others know about WRAP. We welcome your feedback – I’m not just saying this. We want to hear from you. Let us know how we may improve our message, further leverage our resources, and connect with others making a difference in this region. And finally, our volunteers make a difference by being the difference. If you believe this is the right time for you to give something back, then join us in our effort to bring clean water to people routinely deprived of it – not later, now. If you’re interested, please don’t hesitate to contact me or one of our members. We can collectively be reached at info@wrapdc.org.